My last post was January 2013 when I started working at my, then, new job at the EEB Hub. A lot has happened since. I have been here for 1.5 years and I can honestly say I could not have predicted that this job would shape into what it has become. The new site means we are no longer using an outside contractor to maintain our website. It is now hosted within the College of Engineering at Penn State. There are many challenges now that the site is in-house, but, one thing is for sure, it is much, much, much, much cheaper. This website probably deserves its own post at a later date. Our new headquarters is still under construction (http://kierantimberlake.com/posts/view/259/) and planning for the move has been a great learning experience. 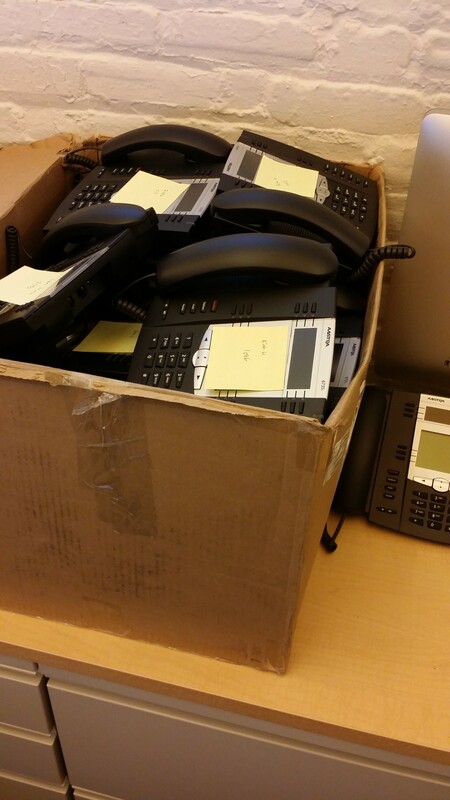 Just today, we received a few of our new VOIP phones. We will be transition to VOIP from analog before the move, so we can port the numbers ahead of time and just “plug and play” once we get to our new offices. There’s a lot more I could write about, but one of the biggest news is that our budget from the Department of Energy has been cut by more than 50%, so our staff has been shrinking. This directly impacts my workload, since I am in a support role. This also opens up some time to catch up and think of places to improve or catch up. For example, I have been working on getting Dell KACE set up on our machines for patching and software deployment. Also, with the extra time, I plan on incorporate blogging into my regular routine, so there should be more consistent updates. Wow. Where has the time gone? World Campus was all someone could ask for from an employer – great people, support, experience, and more. However, I could not pass up the opportunity that was given to me by the Energy Efficent Buildings HUB (www.eebhub.org). I am still technically working for Penn State – as the Hub is a group of researchers, institutions, and companies brought together by the Department of Energy. The grant is managed by Penn State, so my employer stays the same. What will I be doing here? We’ll have to see how it shapes up. I know for sure I will be doing some IT support – Cisco TelePresence, desktop troubleshooting, web development, and whatever else comes up. Stay tuned to see what I actually end up doing! My family will be relocating to the Philadelphia area in a couple of weeks – the EEB Hub is located at the Naval Yard in Philadelphia. New year… new job… new city… new adventures! When the page is loaded, I go through the entire playlist once and create a key/value object with the filename and index. Now I can play the items by name. 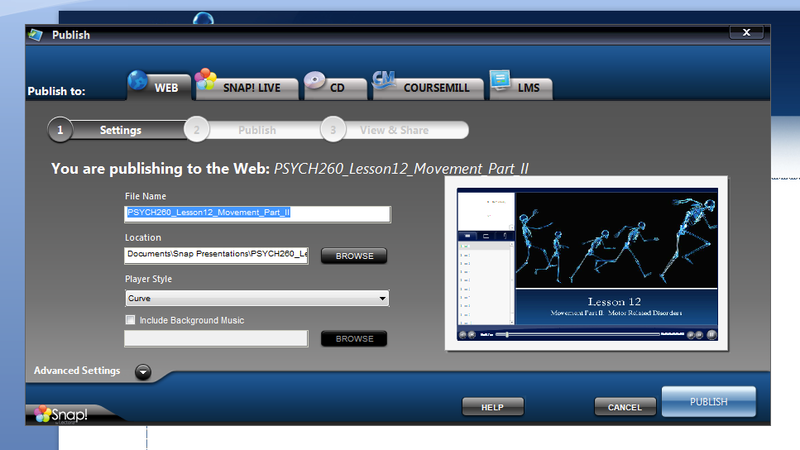 Instead of jwplayer(‘playerID’).playlistItem(39), it will be a much more readable playItemByName(‘the40thitem.mp3’). This will be MUCH more easier to debug and maintain. This could easily be modified to play using the title or description instead. 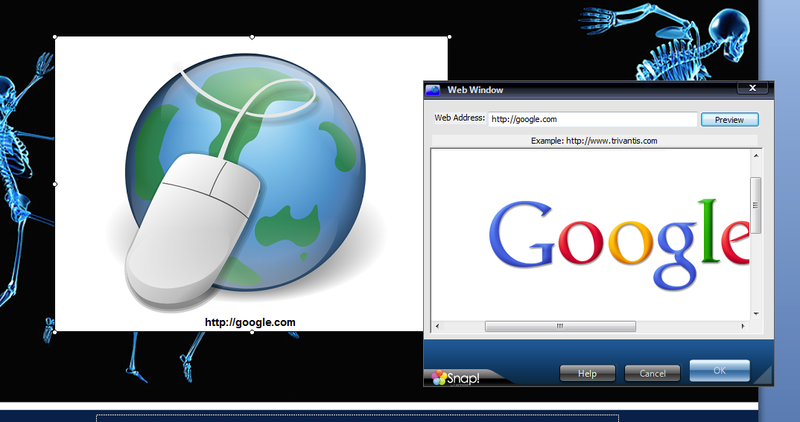 Simple drag and drop exercise using Flash/Actionscript 3. The instructor requested some changes, so we revamped the look/feel as well as the functionality of this short self-assessment exercise. Original can be found at CRIMJ 450w Racial Percentages, Version 1. There’s been a change in Instructional Designer for the course, so now it’s Kristin Bittner. Sliders instead of dropdown menus. Instead of checking if the percentage adds up to 100% on submission, it’s continuously checked as the slider is moved. I had a chance to play around with Snap by Lectora (http://www.trivantis.com/snap/e-learning-software-for-PowerPoint-Presentations) for a few hours. 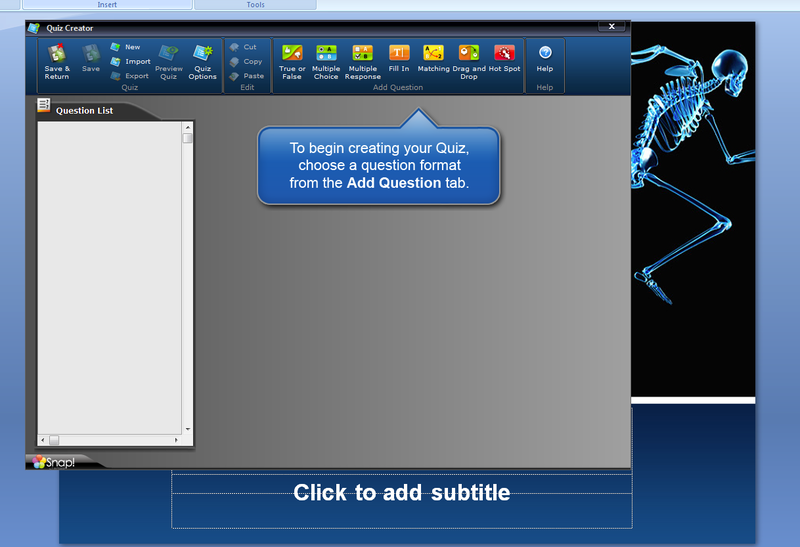 It is marketed as a e-Learning Software for PowerPoint presentations. Their main marketing strategy is presenting themselves as a low cost competitor to Articulate Studio (http://www.articulate.com/products/studio.php) and Adobe Presenter (http://www.adobe.com/products/presenter/). Since one of their main selling points is price, Snap boasts about its $99 price tag compared to Articulate’s $999 and Presenter’s $500. However, it’s also worth noting that Presenter is only $75 through Penn State’s computer store (through Penn State’s agreement with Adobe). 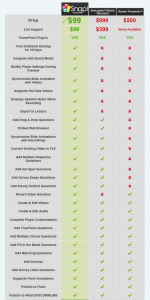 I have had the most experience with Adobe Presenter, so the review will reflect that. I will be making comparisons to Presenter as the standard. The rest of the features are actually very comparable. Snap claims that there are many differences, but the actual differences are not as dramatic. As I have already mentioned, Adobe Presenter is actually very affordable IF your organization has a contract/agreement with Adobe. This is true of many Adobe products such as Photoshop, Illustrator, etc. Although I never called Adobe’s support phone number, it seems misleading to claim “None Available” when Adobe clearly lists a phone number titled “Installation help and product help” (http://www.adobe.com/support/contact/). Additionally, Dean Blackstock from Learning Design has had tremendous success dealing directly with developers at Adobe who have helped with issues and been very helpful when issues have come up (specifically with the Flash Media Server). Another prominent feature on the Snap webpage is social media integration. Unfortunately, when looking closely at all the features of Snap, it turns out there are NO social media features in the Snap product itself. The integration is actually from snapchannel.com where you can upload your Snap presentations (albeit it is very easy to do from the publish function of Snap). I’m not sure why Snap would claim that Presenter does not have this feature, but it’s definitely there. 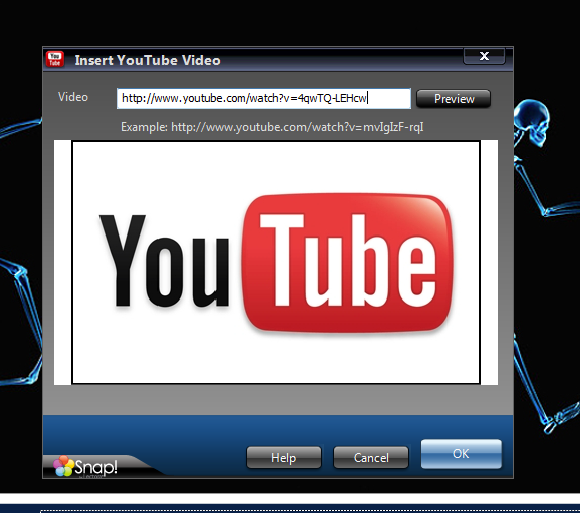 Snap has the ability to embed a ‘web browser’ within presentations. It seemed pretty buggy during testing (the layout was wacky and Angel would force the browser to navigate to a ‘normal’ window instead of using the WebWindow within the presentation. However, this has a lot of potential for bringing tidbits of interactive elements and other course elements in to the presentation interface. The YouTube embed function is extremely simple and well executed. 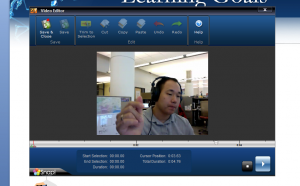 Snap has the ability to import or record videos to be used as a narration for the slides. 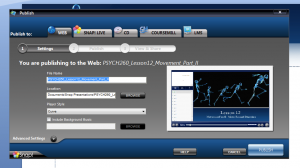 This means that the videos can be synced with custom animations as well. There’s also a very simple video editor built into Snap. 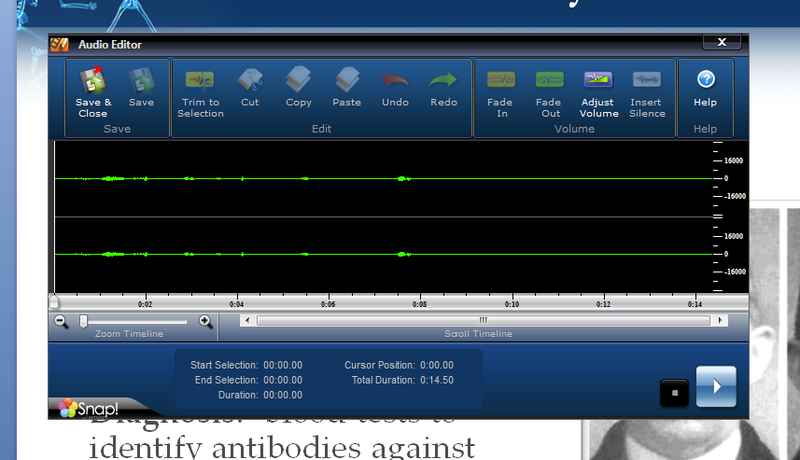 Though it doesn’t have the ability to do any advanced edits, you can trim the beginning and end of the video. Snap does have a larger pool of question types than Presenter. It has drag&drop, hot spot, essay, survey ordinal, etc. 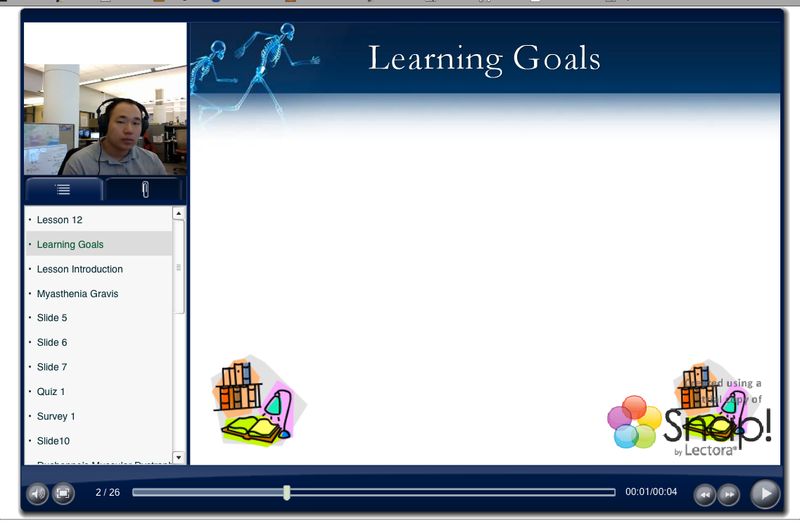 One common workflow at Learning Design is receiving .ppt files with the audio files embedded into the slides. This is because the content authors typically do not have Adobe Presenter installed on their computers. Adobe Presenter can then import the audio narration. However, Snap does not work in this way. Snap can only import files – not internal audio objects. 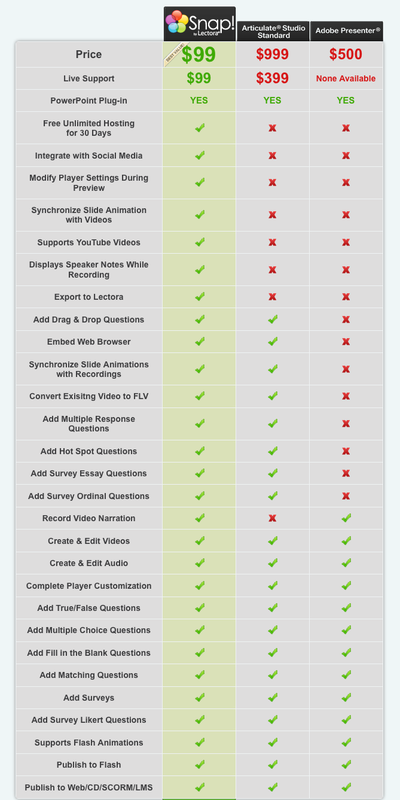 Adobe Presenter’s (second picture) audio edit function displays all the slides and all the sounds in one timeline. Additionally, it also displays the ‘clicks’ for any custom animations within the slides. Snap (first picture) displays one slide at a time and the only way to adjust when the ‘clicks’ occur is by using the “Sync” function, which involves actually playing the audio slide and clicking a button at the desired intervals. Both Presenter and Snap have various publishing options (such as CMS/LMS, web, cd, etc.). The publish function seems to take MUCH longer using Snap. The same 26 slide presentation took Snap a bit under 30 minutes, while Presenter took under 1 minute. Both products produce a professional interface that works well. The text is not rasterized, so it scales well. This also keeps the size down on both products. I would not recommend Snap to anyone who has a need for a PowerPoint plug-in to support narrations and interactive elements. Overall, it is not as polished as Adobe Presenter, but the basic functionality is almost exactly the same. There are a few stand-out features that could push Snap over Presenter, though. If you absolutely need a “WebWindow,” great YouTube integration, video narrations, or more robust quiz questions, Snap is worth a look. The learning curve is pretty low if you are already familiar with Presenter or Articulate Studio. However, if you are not able to get Presenter for less than $500, then Snap is a better bang for your back. Presenter is better, but not $400 better. The dealbreaker is in the advanced editing/syncing. If you have any need to adjust timings on custom animations or do editing on audio narrations, Presenter’s interface is leaps and bounds better than Snap. This is OLD – from 2008, but, blogs.psu.edu can support threaded comments. Just takes a bit of work – modify the template… just a little copy/paste.